Should hydroponic tomatoes be eligible for organic certification? VOF producers can discuss this and other topics at the Annual Meeting. It’s time once again for the annual Vermont Organic Farmers’ Producer meeting. This year the meeting will be held on Wednesday, January 29 from 10-2 at the Champlain Valley Expo’s Miller North conference room, as part of the Vermont Farm Show. This annual coming together of organic farmers and processors is an important tradition that goes back to 1985, when farmers met for the first time to discuss the definition of organic farming. It’s been said that these meetings were sometimes contentious as growers disagreed about what practices and what inputs should be allowed for organic production. But overall, its seems people appreciated the frank and open discussions that challenged growers to improve their practices and pushed them to be more innovative. I often hear growers comment today that they no longer attend the VOF meeting either because they feel powerless within the current system or that they believe there are no important issues left to discuss. This couldn’t be further from the truth! The voices of organic farmers and processors are sought after on local and national levels and the opinions of organic producers carry significant weight. And rest assured, there are still many important issues to discuss where growers’ opinions are needed and valued! This year one of our long-time organic growers has brought one such topic up for discussion. David Chapman, owner and operator of Long Wind Farm, is strongly opposed to the organic certification of hydroponic crops and is asking VOF farmers to vote on a resolution to prohibit the certification of organic hydroponic crops nationally. Farmers and consumers alike can sign David’s petition outlining why hydroponics are not compatible with the organic standards. VOF supports David’s petition and has included the following resolution to be discussed and voted on at our annual meeting. Background: In 2010, the National Organic Standards Board (NOSB) passed a recommendation prohibiting crop production systems that eliminate soil, such as hydroponics and aeroponics, from obtaining organic certification. In this recommendation the NOSB clarified that soil-plant ecology is at the foundation of organic farming. Despite the fact that the Organic Food Production Act mandates that the NOSB advise the National Organic Program on implementing the organic regulations, this recommendation has yet to be accepted and added to the law. Currently some certification agencies certify hydroponic operations as organic despite the NOSB recommendation and the NOP allows this practice to continue unrestricted. Mexico, Canada, Japan, New Zealand, and 24 European countries, (including Holland, England, Germany, Italy, France, and Spain) all prohibit hydroponic vegetable production to be sold as organic in their own countries. Historically, Vermont Organic Farmers has never certified hydroponic operations based on the idea that it is not compatible with organic farming principles. Proposal: Vermont Organic Farmers demand that the National Organic Program accept the 2010 NOSB recommendation to prohibit soil-less hydroponic vegetable production as certified organic. I look forward to discussing this and other topics with organic producers at the Vermont Farm Show on Wednesday, January 29th from 10-2 in Essex Junction. Come join us for a lunch of delicious local and organic food, good conversation, and to make sure your opinion is heard. Please RSVP for the meeting! Can’t make it? Not a certified producer? Leave a comment here with your thoughts! The deadline for comments on the Food Safety Modernization Act has been extended to this Friday, 11/22, due to the issues with the FDA’s web comment portal last week. If you haven’t commented yet, now is your chance! Click here for our commenting guidelines and a succinct summary of the issues. Update, 11/12: As of now, regulations.gov is running again. You can comment on the Produce Rule here and the Processing Rule here. Second update, 11/13: We’ve confirmed that written comments need to be postmarked by 11/15, not arrive by then, so if you’d prefer to send something in the mail (or if the website goes down again), you have until Friday. Apologies for the confusion; the information has been updated below. 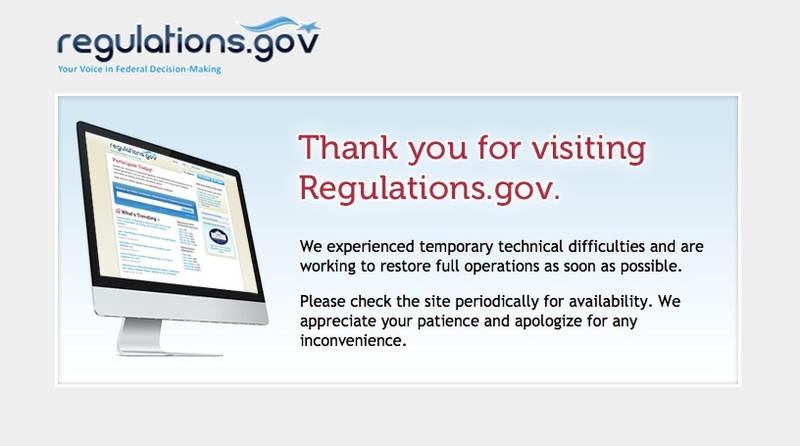 The FDA’s regulation portal continues to be inaccessible due to “technical difficulties” as the comment deadline for FSMA nears. We are advocating for an extension of the deadline, but cannot say whether it will happen. You can mail your comment to the FDA, but mailed comments must arrive at the FDA be postmarked by 11/15. That means to guarantee they’ll get there on time, you should mail them today! 5630 Fishers Lane, Room 1061, Rockville, MD 20852. FDA-2011-N-0921 and the Facilities/Processing Rule is FDA-2011-N-0920. Also include your name and farm/business or organization affiliation, if any. Thanks to everyone who is taking the time to make their voices heard! If you’re still wondering how FSMA might affect you, read on. The following article originally appeared in the Fall issue of NOFA Notes; we realized it was a good synopsis of the issues most affecting Vermont’s farmers, processors, and consumers, and so are reprinting it here. The deadline to submit comments on the Food Safety Modernization Act (FSMA) is next Friday, November 15. View the slides from our recent webinar on how to craft a powerful comment. The National Sustainable Agriculture Coalition’s FSMA webpage has in-depth coverage of the bill and what might affect your specific situation, as well as comment guidance and templates for consumers and farmers. NSAC has useful comment templates for farmers and consumers. When Congress was debating the Food Safety Modernization Act (FSMA) in 2010, NOFA Vermont joined farm and food advocacy organizations around the country in a successful effort to amend the law to minimize FSMA’s impact on local food systems and family-scale fruit and vegetable farmers. After all, numerous studies have found that the nation’s food safety “problems” are largely a result of large-scale production, processing, and distribution systems, and not caused by family-scale farms that serve local and regional markets. President Obama signed FSMA in January, 2011 and handed it to the FDA to figure out how to implement the most sweeping food safety reforms in 70 years. We crossed our fingers. Would the FDA “get it right”? Would Vermont’s fruit and vegetable farmers be able to continue their work without worrying about unnecessary and costly new federal food safety regulations? The deadline to comment on the Food Safety Modernization Act is Friday, 11/15 – less than two weeks away. Today, we held a webinar in partnership with UVM and the Vermont Agency of Ag to help farmers (and other concerned citizens) craft meaningful and powerful comments. The future of Vermont’s food system will be changed by this bill! Please take the time to make your voice heard. To learn more about FSMA and its potential impact, take a look at our previous posts on the subject. We also recommend the National Sustainable Agriculture Coalition’s easy-to-understand “toolkit” of information. The Food Safety Modernization Act (FSMA) is the most sweeping reform of our nation’s food safety laws in more than 70 years. It was signed into law by President Obama on January 4, 2011, but the specifics of the law are still being worked out, and the public comment period ends on November 15. When finalized, these rules will affect many Vermont vegetable and fruit growers – large and small. Along with UVM Extension and the Vermont Agency of Agriculture, NOFA Vermont is hosting a webinar for farmers and others that will highlight the elements of a strong comment, give examples of potential talking points for different types of farms (focusing on alternatives to the proposed rules), and walk you through how to submit comments on the Federal Register. Space is limited. Click here to reserve your Webinar seat for November 4th from 12 -1 pm. 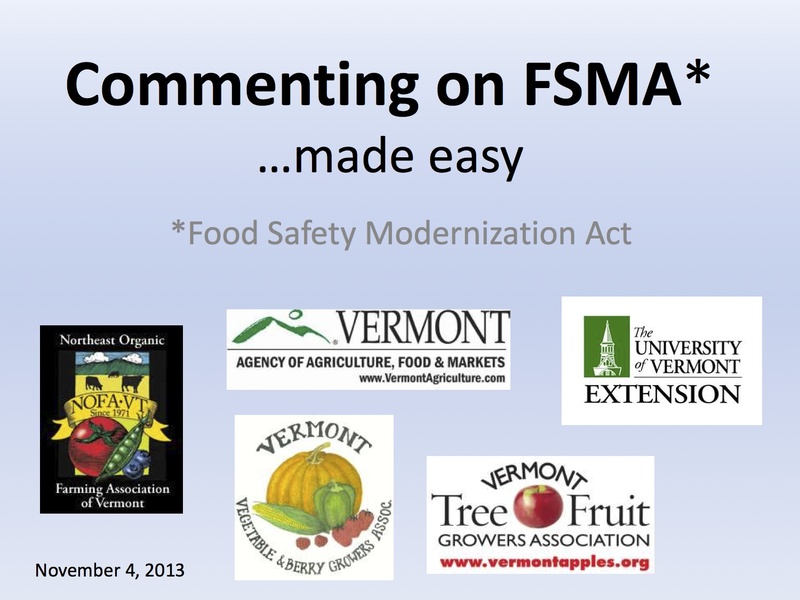 PLEASE NOTE: The purpose of the webinar is NOT to explain the details of FSMA, but to help you submit your comments. If you are not familiar with FSMA, please use one of the following resources to learn more beforehand. Learn more about the Food Safety Modernization Act and how you can speak up for small farmers with this webinar on Thursday at 4:30 from the National Sustainable Agriculture Coalition. 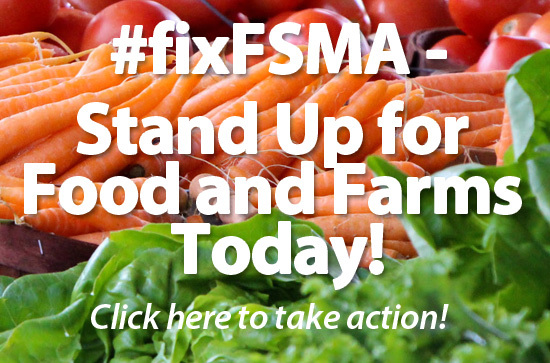 This is intended especially for farmers and supporting organizations that need to get up to speed on the basics of the FSMA and how to take action.